Discovery (Birth to 6 years old): Gives the youngest players the opportunity to develop basic movement skills like running, jumping, landing, kicking, scooping, throwing and catching in a fun setting, built around informal play and positive reinforcement. Kids play and explore movement through many physical activities. Fundamentals (6 to 9 years old): Allows children to develop their movement ABCs — agility, balance, coordination, and speed — and learn the basics of the game while emphasizing fun, cooperation, and maximum touches with the ball. Kids sample lots of different physical activities and sports. 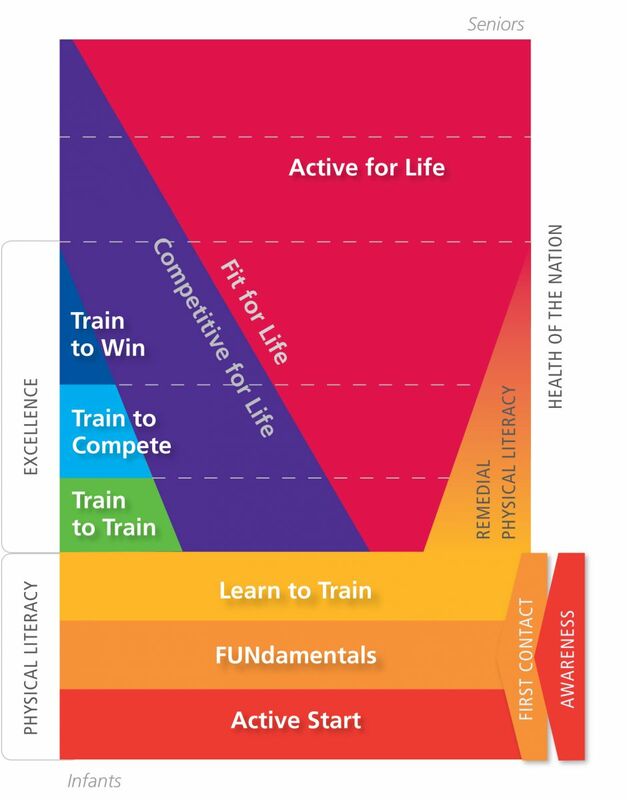 Foundations (8 to 12 years old): This is the “golden age” of learning and sport skill development. Children become less self-centered and are able to reflect on their actions and learn from their mistakes. This is the optimal time to learn and build a large repertoire of lacrosse-specific skills and learn the basic principles of play in a fun, challenging environment. Players sample many physical activities and sports in addition to lacrosse. Emerging Competition (11 to 14 years old): This is the stage in which we make or break the athlete; when children choose to continue participation in the sport. This is the time for developing strong technical skills and is the dawning of tactical awareness. Players are also introduced to concepts like mental preparation, goal setting, and coping with winning and losing. Players learn advanced technical skills and position-specific techniques. The major focus is on applying skills, strategies and tactics from practice to competitive situations. Athletes participate in several sports throughout the year or in a variety of physical activities.